In 1901 Ernest Shakleton sailed on his first expedition to Antarctica with Robert Falcon Scott. Six years later he led an expedition that reached 88°23´, 97 miles from the South Pole. In 1914 he led the Imperial Trans-Antarctic Expedition. The plan was to cross Antarctica from Vahsel Bay to the Ross Sea. Unfortunately their ship the Endurance was caught in the ice and crushed. The party was forced to camp on the ice until they could launch their boats. They reached Elephant Island in April 1916. Shakleton and five others sailed for South Georgia in an open boat. They made a landfall on South Georgia and crossed the island on foot. They got help and finally rescued their companions. 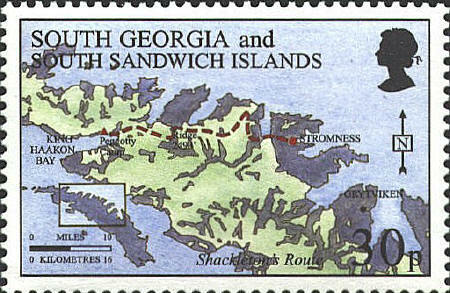 The map shows their route across South Georgia from “Peggotty Camp” across Ridge 2493 to the Stromness Whaling Station. It is based on a British Antarctic Survey map. Three of the men who made the trek are commemorated on other stamps in the set showing the beginning, the ridge and the goal of their effort.